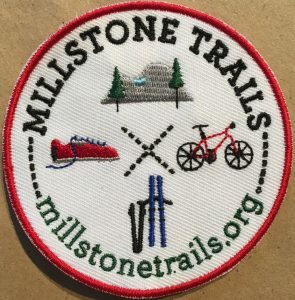 Introducing the Millstone Trails Badge Challenge! It’s the perfect opportunity to get to know the trails, inside and out! Pick up (or print out) an entry form, and head out on the trails. Follow the instructions as you explore, and don’t forget to post photos with our tag #millstonebadge, and tag @millstonetrails on your social media! Complete the entire challenge and send the form to us, and we’ll mail you back an exclusive, custom-designed patch, along with a couple of bonus matching stickers! This challenge is the only way to obtain this exclusive swag, so hit the trails today! Paper entry forms will soon be available at the Brook St. garage, in a transparent brochure holder mounted on the back wall. You will also be able to pick them up at Vermont Bicycle Shop or at the Barre Town Offices. Or, if you prefer to print your own, just click here to download the form. This program was developed by Alex Maurice and Isaac Lobb, 2018 graduates of 8th grade at Barre Town School. This was their CSL (Community Service Learning) project, which is a requirement for graduation for every Barre Town 8th grader.